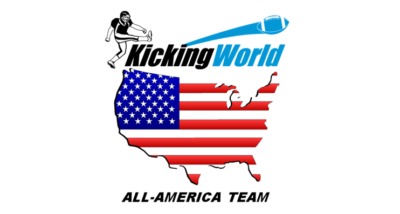 Check out Kicking World's top performers for the Spring 2017 camp season. The best kicking and punting prospects in the country. It’s been a busy 10th camp season at Kicking World and our 2017 spring camp tour did not disappoint! We’ve coached hundreds of the best kickers, punters and snappers from across the nation over these last 3 months. Below we highlight the top camp performers through May of 2017. All of the mentioned specialists show college level legs. So far, 2 campers earned a spot on our exclusive Hot Prospect List that is currently made up of less than 20 of our best prep recruits from around the country. Congratulations to Class of 2018 Texan kickers Matteo Cordray (Highland Park HS) and Jacob Zepeda (Rouse HS). We are expecting them to dominate their senior season and obtain multiple offers. Each are in the top 5 of our best available 2018 kicker prospects. The above 4 young men from Texas and Mississippi showed explosive legs, great attitudes and consistent performances all weekend. We are looking forward to re-evaluating them again soon and seeing them at the 2017 Showcase in Austin, TX! Why do our assessments & recommendations matter? We take pride in connecting with our students on a personal level, knowing every camper’s name and making a positive impact on not only their football career, but guiding them into becoming accountable young men. College coaches place a much higher value on our recommendations because they know we spend time with each student and get to know the person as a whole, not just if they have a strong leg or not; we evaluate character, reliability, poise under pressure, form, fundamentals, having a duplicable process, and a lot more. Coach Brent e-mails the Hot Prospect List and ‘on the cusp’ recruits 4 times a year to college coaches to help Kicking World campers get noticed. He also remains in constant contact via text, e-mail and phone with hundreds of college football coaches throughout the country. Our season-ending Showcase is streamed live on YouTube and every college football program is well aware of the talent draw of this special event. In each of the last 4 years of this event, multiple students received scholarship offers immediately following the Showcase! Becoming a Kicking World Hot Prospect is the highest honor a HS specialist can achieve. It provides an immediate recruiting boost and maximizes eyeballs to that student. Be sure to check out our Hot Prospect FAQs on the Hot Prospect List to see why you need to make this list if you want to accelerate your college football recruiting efforts. Find a Camp and get started today.